RDFa is a syntactic format that allows RDF triples to be integrated into hypertext content of HTML/XHTML documents. Although a growing number of methods or tools have been designed attempting at generating or digesting RDFa, comparatively little work has been carried out on finding a generic solution for publishing existing RDF data sets with the RDFa serialisation format. This paper proposes a generic and lightweight approach to generating semantically-enriched hypertext content by embedding RDF triples derived from diverse provenances in terms of a concept of topic nodes which will be automatically recommended by our discovery algorithm. RDFa2 is a proof-of-concept implementation for our approach and works as an online platform assisting Web content publishers in semi-automatically generating, personalising and curating pages with RDFa. 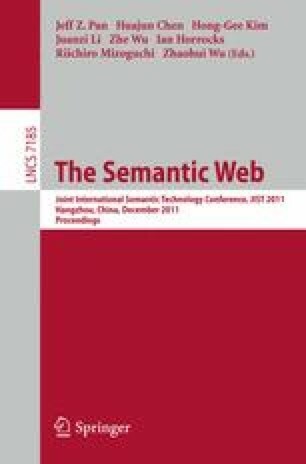 RDFa2 has been introduced and employed by students in a master level course and the experimental results as well as additional case studies indicate the validity of this approach to generating triple-embedded Web documents such as online profiles and vocabularies with little user intervention.